DESERT LIVING - A BREAK TO JOSHUA TREE — The Eternal Child. Like -- how the tall tall trees and lush mountain tops of the north race my heart, the desert calms me, feeds my need for peace and opens my ever racing thoughts and replaces them with clarity. I don’t live far from the desert, I live in the Valley, on the other side of the mountain from Hollywood. On a good day you can travel there in a matter of minutes. I discovered this years ago after moving to Los Angeles. Before I had ever even dreamt of joshua trees and giant rocks. However, now my window ledges are covered with cacti and other desert treasures that remind me of my time spent their and my need to return. I went back out to the desert this past week. Went to meet some good friends that were staying in Palm Springs and decided to rent a homestead in Joshua Tree. We stayed at a beautiful house up Nevada Trail, on a few acres of land, down a dirt road. A newly renovated homestead from the 1950s, with concrete floors and a wood burning fire. It was divine and I can not wait to return. On our way into town we stopped at a few of my favorite spots. On the drive down 29 Palms Highway you can find some hidden gems. We first stopped at Hoof and the Horn and I found a beautiful handmade ceramic coffee pour-over by Urthen Ceramics— a local company. I had been looking for a good pour-over for some time now and knew when I saw it, that it would fit perfectly in my home. I paired this with some Joshua Tree Coffee Co. beans and already was craving the dawn. 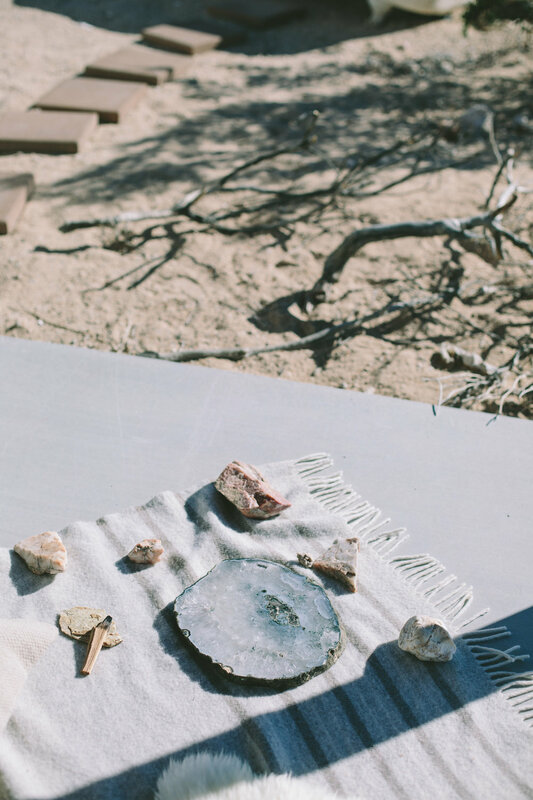 We then made a few more stops at; The End vintage shop, Nomad Ventures and then naturally, just had to pick up some Palo Santo sticks for burning and a few new geodes, from the Joshua Tree National Park Store. I have found this to be the place I always stop while visiting. Their incense and crystals are only a few dollars and they have the best collection of both. Never underestimate the power of a good national park shop. It's also just so very charming. This trip was an actual break for me. I have had an interesting year filled with ups and downs, regarding my work and personal life.. but I guess that’s just how it goes. I’ve been reflecting more these days, on my behavior and choices in this short life. I want to be proud of who I am, the relationships I hold so dear and the love for my family. I refuse to act in the face of judgement or negativity and want to demand that level of compassion and grace by the people I walk amongst. So these breaks are so important, to gain more clarity and just breathe. I hope you enjoy my guide to a break in the desert. I have added in a few essentials for your trip, if you dare to try one. This trip I wasn't able to stop by, but when visiting Joshua tree, you must visit The Integration -- for a sound bath with 15 crystal bowls. Its unlike any experience.